Gendun Gyatso (Tib. དགེ་འདུན་རྒྱ་མཚོ་, Wyl. dge 'dun rgya mtsho) (1475-1542) — the Second Dalai Lama. 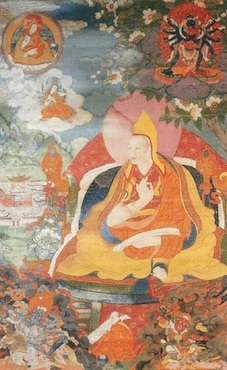 Born into a noble Nyingmapa family of Tsang, Gendun Gyatso would only be formally enthroned at the Tashilhunpo Monastery founded by his predecessor, at the age of eleven, after having received a number of empowerments and teachings of both the Nyingma and Sarma traditions from his father who was a great Nyingmapa yogin. His writings include a commentary on Chanting the Names of Manjushri. This page was last edited on 16 April 2018, at 23:57.